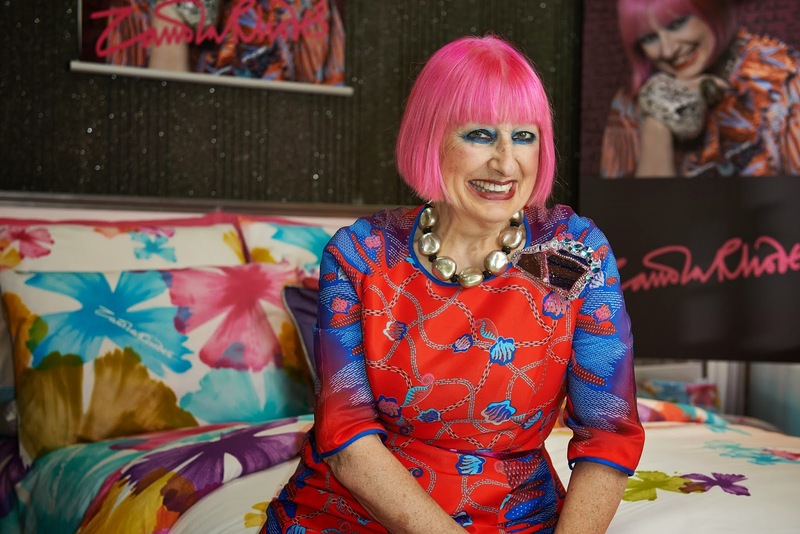 Last week colourful style icon Dame Zandra Rhodes launched her new collection of amazing bed linen at Sterling Furniture in Glasgow's East End, which just happens to be Scotland's largest furniture superstore. 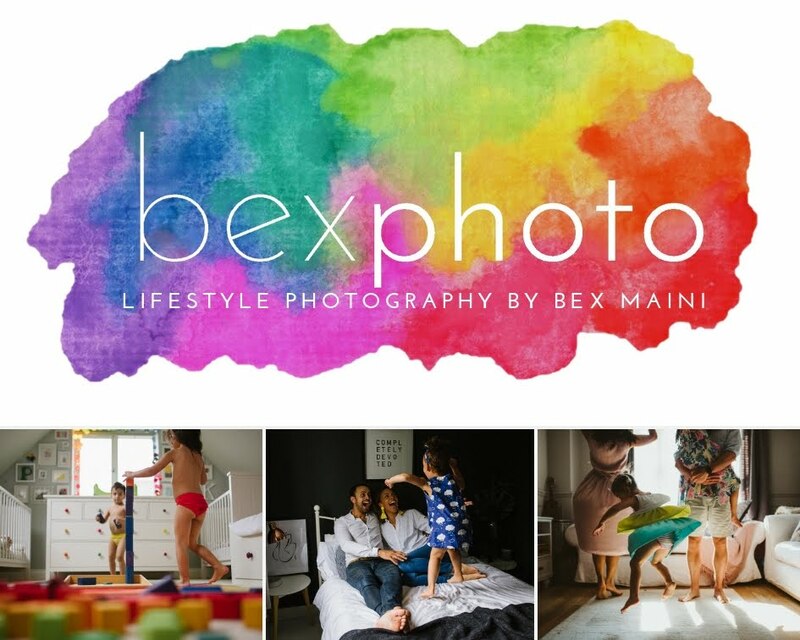 I was invited along by Palompo PR and Bex was gutted to miss it. 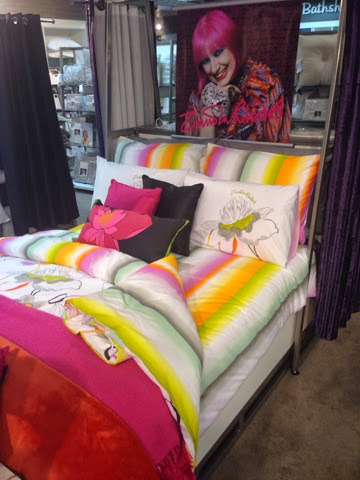 The new bed linen collection features three bright collections, Milo, Vader and Juno, all of which I liked. When I received the invite it felt like perfect timing as most of the rooms in the Forever House are now painted and we're in need of some stunning bedding to complete the rooms. Dame Zandra introduced the collection and told us she loved working with fabrics, as opposed to always working with clothes and that she was excited about this range as she believes a set of bed sheets can truly transform a room. The Vader print is a splash-painted design with a dot painted reverse in a dazzling colour spectrum. Zandra explained that this design actually came about by accident as she was simply testing colours on her sketch pad and noticed a distinctive pattern! Juno has giant flowers in the brightest of colours from yellow and turquoise to orange and purple. I'm not usually a big fan of florals but there was something about the design I loved. ...the striped underside and sheet are revealed. I think this would look fabulous in a lovely grey bedroom (all three would) and I really wanted to buy a set for our bedroom but they only went up to king size and we have gone with a superking. Can't beat a massive bed! It's was interesting listening to Dame Zandra talk about her work and inspiration, she told us that she is always doodling in a sketch pad with felt tip pens and is inspired by her friends and holidaying in new places. She tries to keep one of everything she's ever made! That must be one colourful collection!! 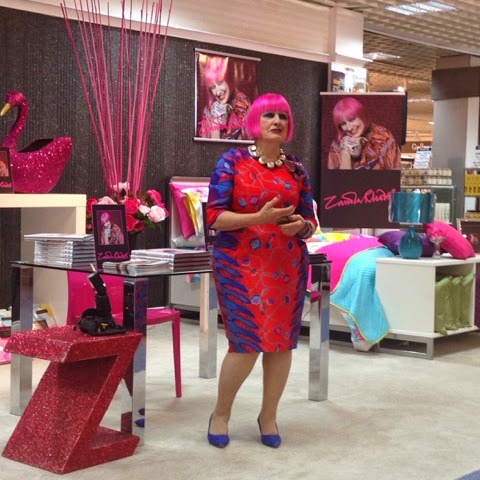 As you could probably guess, Dame Zandra has a very colourful house and she spoke about the rainbow of colours colours on her floor in her London home. Initially it was drawn on with chalk and painted but the paint didn't very wear well. The original design is still there but is now done with Amtico tiles. Sounds amazing! One of the final questions Dame Zandra took from the crowd asked what she was most proud of in her career, I loved her answer. 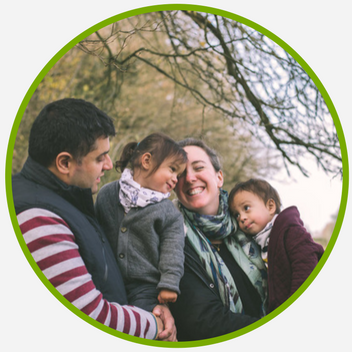 She laughed and said she was proud that she was still going but then added that she felt genuinely lucky, that she loves her work and looks forward to doing it. 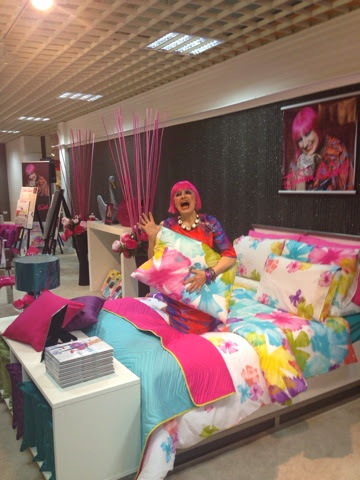 The new Zandra Rhodes bed linen collection is available from Sterling Furniture Homestores in Glasgow, Tillicoultry and Aberdeen and online at www.sterlingfurniture.co.uk. The range is available in Single (£25), Double (£40) and King (£45) sizes. Do let me know if you like the collection and which piece is your favourite? I love the first one - it is so happy and colourful. And King Size is plenty for us. I might see if I can tempt M with it. Pregnancy update - week 28!